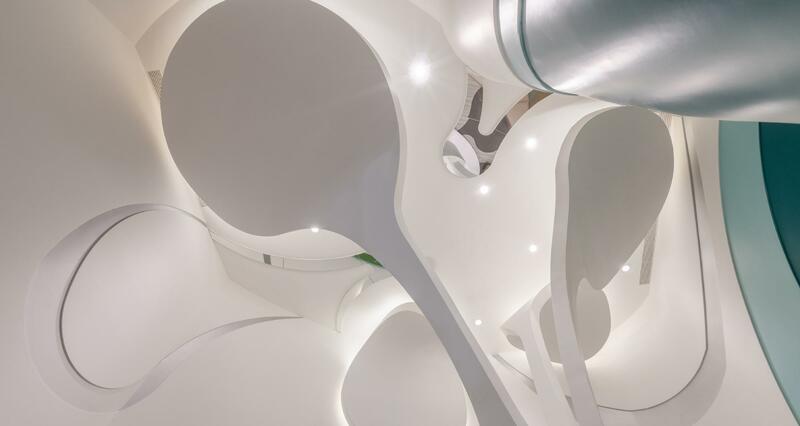 Design & picture credits Cai-In Interior Design Co., Ltd.
Our design seeks to evoke the feelings of safety; the white, egg-like exterior is suggestive of a uterus, whose purpose is to elicit feelings of safety, relaxation and security, to soothe children’s excitable and restless nature. Sensory development can be stimulated more effectively once (the children’s) emotions are stabilized. To soothe children’s emotions via the use of colors and lines Colors are closely related to children’s psychology and emotions. 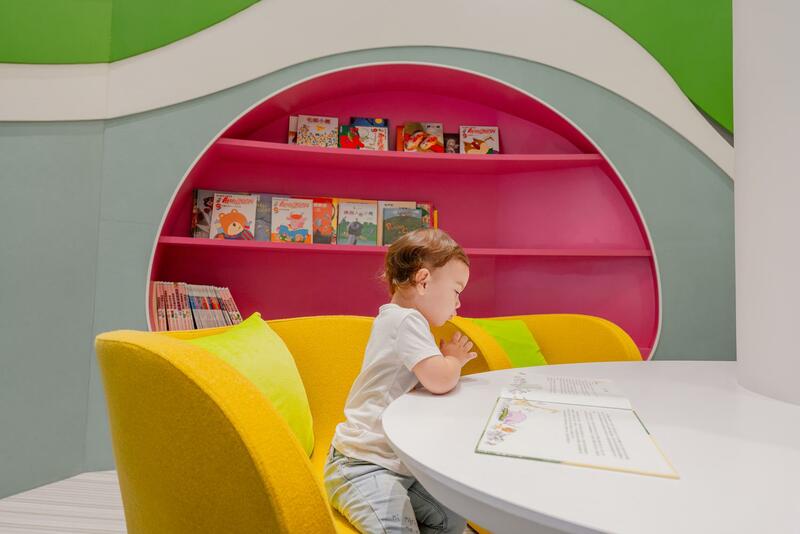 According to experts and scholars, the more colors that people are exposed to during infancy and early childhood, the better their learning and cognition abilities. Colors also bring out the inner moods and personality tendencies of children. For example, bright and warm colors are good at attracting attention, they will therefore make good background colors for children’s book displays. Vivid greens remind people of forests, trees, peaceful serenity and the feeling of being protected; from a psychological perspective, green represents rationality and the capacity for self-control. We have also added a variety of contextual lighting to enhance the presentation of an environment with saturated and layered colors. 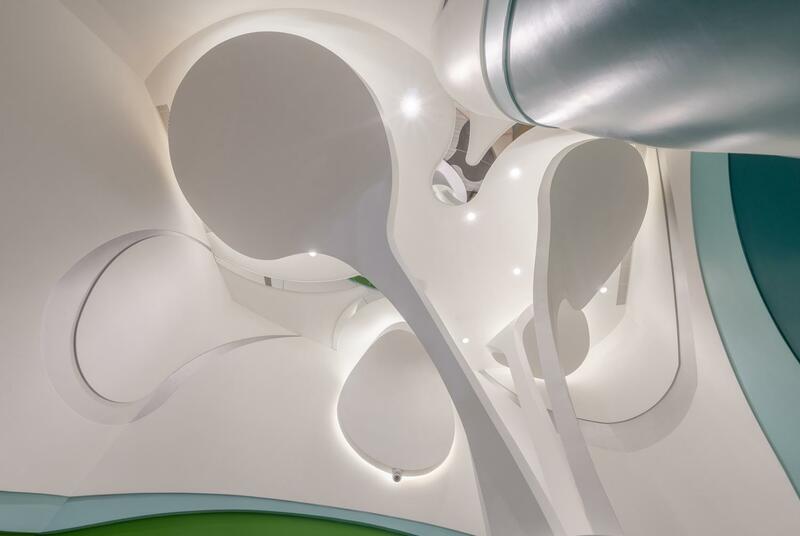 Multi-layered flowing ribbons in varying colors surround the space to train and stimulate dynamic vision. To stimulate children’s imagination via specific imagery Figurative patterns can stimulate the brain’s imaginative and associative powers, and more importantly, they can cultivate one’s capacity for three-dimensional perception. Therefore, we installed a huge white sapling in the center of the space to serve as the focal point of the venue’s reading area. The upward reaching stems and leaves house lights and make up a portion of the ceiling’s design. 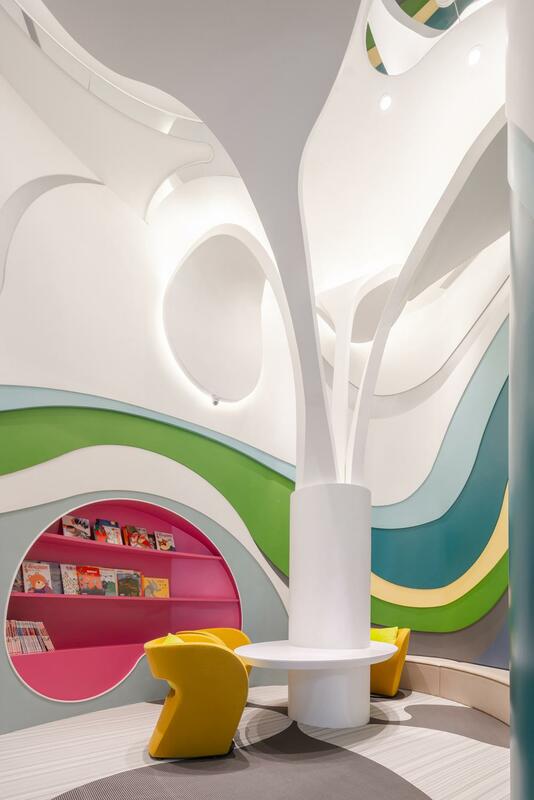 The floor features variegated patterns and the use of different materials, providing a safe and healthy resting place for the children in the community via lively and natural imagery.